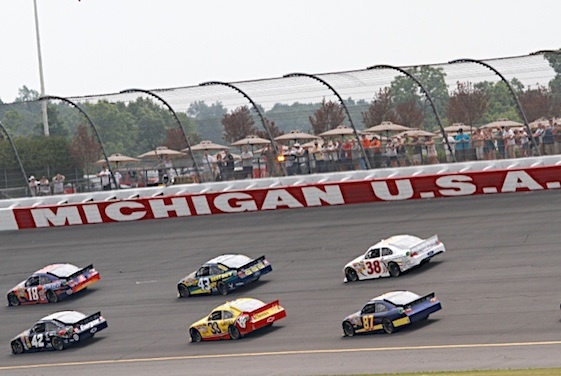 Racin’ Today » New Michigan Surface To Produce New Problems? New Michigan Surface To Produce New Problems? Stepping into NASCAR’s repavement-controversy spotlight this week is Michigan International Speedway. The track, which just got a fresh coating of asphalt, enters the spotlight thanks to comments Matt Kenseth issued after testing Wednesday. Kenseth got out of his car and said he had just gone more than 215 mph in the straightaways. Michigan has always been one of the fastest tracks in NASCAR. Average qualifying speeds have been well into the mid 190s. Straightaway speeds above 200. But 215 sounds high and for Kenseth, apparently, felt high. least for a year or two until it gets more worn out and the pace comes back. 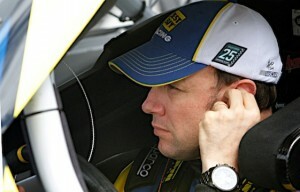 Kenseth stressed that Wednesday’s test was on a track that was new and dirty and that it will burn in with more use. And he said that the look of the racing there will be determined by Goodyear. But talk of 215 or 216 is sure to raise some eyebrows in the garages and at the NASCAR research and development center in North Carolina. Also testing Wednesday were Jeff Gordon, Brad Keselowski, Juan Pablo Montoya and Kyle Busch. Montoya said minimum speed was 189 mph, but cars were going above 215 in the straightaways. The repave was concluded last November. This was the fourth repave – 1977, 1986 and 1995 – of the track in Brooklyn. Chrysler announced that a factory-backed SRT Viper Racing team will return to the American Le Mans Series in this season. SRT Motorsports has partnered with Riley Technologies, based in Mooresville, N.C., on the design-and-build process of the new SRT Viper GTS-R.
Two SRT Viper GTS-Rs will compete in the production-based GT class in the series. Four drivers currently are signed to drive including Dominik Farnbacher, from Ansbach, Germany; Marc Goossens from Geel, Belgium; Ryan Hunter-Reay from Dallas and Kuno Wittmer from Montreal. Additional driver and team announcements will be forthcoming. Scott Atherton, President and CEO of the American Le Mans Series, hails the SRT Viper’s return to the Series as one of 2012’s top announcements. Driver Ryan Truex Jr. will spend the upcoming weekend off from the Sprint Cup Series chasing a world speed record. On water, but from land. Truex will be in Huntsville, Ala. trying to break records for radio control boating.